Wind is one of the earth's most sustainable natural resources when it comes to generating electrical power. All you need to do to harness it is to construct a wind power turbine that the converts the movement of the air into kinetic energy. Capturing wind on a large scale, however, requires a wind farm—a collection of specially designed wind turbines positioned across the landscape or ocean, where the winds are steady and strong. Wind turbines have multiple blades, which are set high on towers, that spin in the breeze and harvest power. Industry experts say the United States has enough wind resources to effectively double its current wind generation capacity, and that doing so comes with a slew of environmental benefits. In America alone, wind power prevents the release of about 62 million tons of greenhouse gases and conserves 20 billion gallons of water annually. Potential obstacles to building wind farms include the public controversy over the placement of the wind turbines, permitting challenges, financial concerns, and technical issues, such as the need for infrastructure to transmit the power to the electrical grid that serves customers. However, if you wish to construct your own wind farm, it's actually not too hard to do. Building a wind farm is a big project that requires teams of specialists to handle the many aspects of the project from conception to planning, to implementation. A lot of planning goes behind building this special type of energy generator, from selecting the proper location and assessing the risk to wildlife, to acquiring the proper permits and implementing and testing the turbines themselves. First, make sure to choose a location that has enough wind resources. The best sites for commercial wind farms have wind speeds of 13 miles per hour (6 meters/second) or more, according to the American Wind Energy Association. Too much wind can actually strain equipment and make the project more expensive. Special wind speed maps can help you identify a region with suitable wind resources. For example, the U.S. Department of Energy offers a handy wind map, but you can also use a tool called an anemometer to measure wind energy at a specific site. Some states even offer anemometer loan programs. Your engineer may use specialized services and software, such as windNavigator and GHWindFarmer, to analyze topography, weather conditions, and aerodynamics in order to optimize the location. Furthermore, you’ll need to consider special concerns of the target location, such as road access, potential noise impacts, flickering shadows from the blades, and cultural issues. The spinning blades on wind turbines can kill endangered birds, bats, raptors, and waterfowl, so it’s best to position turbines away from busy wildlife corridors and annual migratory paths. The U.S. Fish and Wildlife Service’s Wind Turbine Guidelines Advisory Committee recommends a tiered approach that includes a preliminary assessment, site characterization, and field studies to predict and assess the species and habitats harmed by the wind farm. As the site developer, you’ll need to work closely with the appropriate government agency (or permitting authority) to reduce and mitigate deaths of animals due to the wind farm. In some cases, you may be allowed to build the wind farm if you alter its operation to be more wildlife-friendly. For example, you could be required to temporarily stop turbines during migration season and during periods of low wind, when bats are most active and power yield is minimal. Think about how much energy you want to produce—or how much the site can produce—and how much money you can spend. Purchasing wind turbines alone can set you back an average of $1.37 million per megawatt of capacity. Generally, it’s cheaper for utilities to develop wind power facilities than it is for private investors because utilities can tap into favorable financing structures that reduce costs by about 30 percent, or about 1.4 cents per kilowatt-hour, according to a report funded by the U.S. Department of Energy. Government stimulus programs also make it easier to develop a wind farm. The production tax credit (PTC) now provides a 2.3-cent-per-kilowatt-hour tax credit during the first decade of operation. If you begin construction on your renewable energy facility prior to 2020, you may make an irrevocable election to claim an Investment Tax Credit (ITC). To project the levelized cost of financing your wind project, plug your specific details into the interactive BITES tools (Buildings, Industry, Transportation & Electricity Scenarios) provided by the National Renewable Energy Laboratory. You may also want to browse the database of state and federal incentives for renewable energy. Electricity producers are governed by federal laws such as the Public Utility Regulatory Policies Act of 1978 (PURPA), the Energy Policy Act of 2005 (EPACT 2005), and the Energy Independence and Security Act of 2007 (EISA 2007). In addition, individual states have different interpretations of how these federal laws apply, and they have varying mandates to promote renewable energy through Renewable Portfolio Standards (RPS) legislation. A lawyer or consultant specialized in renewable energy development can help you navigate the laws governing your proposed project. You will also need various building and environmental permits from government agencies. If your wind farm will sit on government property or has a federal agency partner, permitting can be contingent on a formal environmental impact assessment process. For example, wind farms placed on property managed by the U.S. Bureau of Land Management are governed by certain guidelines intended to protect federally protected species and other natural resources. Modern wind turbines are sleeker and bigger than old-fashioned windmills, with enormous blades and towers as tall as high-rise buildings. The precise placement of these turbines on a wind farm affects its overall energy production. As a general rule, the larger the wind turbine, the greater its generation capacity. The most commonly installed wind turbine has a capacity rating of 1.5 megawatts and can power up to 500 homes, but newer models run even bigger. General Electric’s website lists sizes up to 3.4 megawatts for onshore use and up to 6 megawatts for offshore. Other leading wind turbine manufacturers include Vestas, Goldwind, Enercon, Siemens, Sulzon, Gamesa, United Power, Ming Yang, and Nordex. Large and heavy wind turbines require bigger foundations and cost more to install. Offshore wind turbines must be designed for ocean conditions. Wind turbines rarely run at full capacity since their energy generation is weather-dependent. In addition to wind turbines, a wind farm requires an electrical power collection system, transformers, a communications network, and substations. What's more, a supervisory control and data acquisition (SCADA) information system is used to monitor performance. An engineer can recommend suitable equipment and turbine placement based on your site, finances, and energy goals. If you’re planning a commercial-scale wind farm, you need a way to deliver energy to wholesale or retail customers. Typically this requires transmission lines linking the output of your wind farm to the electric power transmission network—the energy grid—in your region. 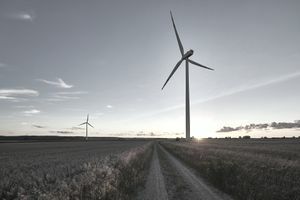 Commercial wind farms sited in remote locations can find it a challenge to secure transmission capacity and interconnectivity with the grid. Alternatively, smaller wind farms can be used as a dedicated source of electricity for a community or business. In these cases, the wind farm may not require a link to the regular electric grid. However, to sell excess power, you still need a way to deliver that power to the electric utility. Check with the National Renewable Energy Laboratory (NREL), which works with wind developers to secure transmission capacity and interconnectivity. The Utility Wind Integration Group also provides resources for connecting a wind farm into the electric system. Wind farm construction can be completed within a few months. However, you may first need to build roads into the site for hauling in the wind turbines and other equipment. For each wind turbine, you’ll need to excavate a hole and fill it with reinforced concrete to serve as a stabilizing foundation; this process is more demanding in rocky conditions or offshore wind farms. Once the foundation is prepared, you'll need to erect the turbines with specialized hoists. Next, you'll put the electrical wiring and systems in place and run tests to ensure that all the elements are operating properly. It often takes six months before the kinks are ironed out and the wind farm achieves full commercial production capacity. Each wind turbine needs about a week’s worth of routine maintenance per year. The American Wind Energy Association says it takes one wind technician to service every 10 megawatts of installed generating capacity.